Boating can be a truly enjoyable and rewarding experience. Even so, when you’re on any stretch of water, you can be exposed to foul weather and potential danger. Here you can find important safety information to help ensure you’re well prepared in the event of an emergency on the water. If you get into difficulty in Australian waters and need to activate your EPIRB or transmit a distress call on your radio, the Australian Maritime Safety Authority’s Rescue Coordination Centre in Canberra will receive your distress signal or be notified of your situation. The Centre operates 24 hours a day and will coordinate your rescue, or they’ll delegate the role to the relevant regional police organisation. 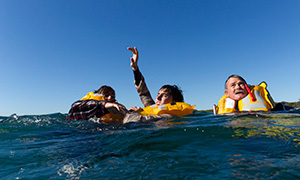 If an emergency happens, you should make sure everyone on board is wearing a lifejacket. Also, listen carefully to the instructions being given by your rescuers and above all, stay calm. Always plan, prepare, check the weather forecast regularly, log on to the marine radio network when you leave port and don’t forget to log off when you’re safely home. Check that you have all the required safety equipment on board. Make sure all your safety equipment is in good condition and easily accessible in the event of an emergency. Make sure you and your crew know how to handle the boat, especially on the waterway that you’re using. If you’re in any doubt, get information from locals or the local marine authority, such as MSQ. Check the weather. If you’re in doubt, don’t go out. Make sure you have sufficient water and fuel for the duration of the trip, including unexpected delays due to the weather or an equipment breakdown. Go easy on the drink – waves, wind and weather can multiply the effects of alcohol. One third of all boating fatalities involve alcohol. There are a number of ways you can get help and to alert the search and rescue agencies, including radio distress calls, distress flares, overdue reports and activation of an EPIRB. AusSAR, a division of the Australian Maritime Safety Authority (AMSA), is Australia’s national search and rescue authority and runs the Rescue Co-ordination Centre (RCC Australia) in Canberra. RCC Australia can be contacted 24 hours a day on 1800 641 792. You should repeat all distress calls three times. If you hear a mayday call, you should not transmit, but continue to monitor the radio. If a shore station such as the local Coastguard or Coastal Patrol fails to respond to the call you should attempt to relay the message and render any assistance. You should throw a lifejacket or marker over immediately. If you lose sight of the person in the water, this will act as a starting point for a search. Try to keep the person in sight at all times; tell passengers to act as lookouts. As quickly as you can, establish your position either by reference to shore marks or by a GPS position. You should also make sure you and all of your crew know how to activate the Man Overboard function on your boat’s GPS. If you can give an accurate position, it will be crucial if the search needs outside assistance. Try to get in contact with the relevant search and rescue authorities. Hypothermia is the effect of heat loss from the body. It happens when your body temperature is lowered to less than 35°C. It can affect your brain, heart and other internal organs. While your body begins to cool as soon as you enter the water, the full effect of hypothermia can take around 30 minutes. Some of the effects you get with hypothermia are a reduction of blood flow to the hands, feet and surface of the body. You’ll also experience intense shivering in the early stages as your body tries to maintain its core temperature and then no shivering in the later stages. To reduce the risk of hypothermia, you should wear warm, preferably woollen, clothing under wet weather gear. HELP (Heat Escape Lessening Posture) – limit your body heat loss by holding your arms down to your sides and up across your chest, and raising your knees and holding them together. Huddle – by huddling close together with other people, so that your chest and arms are protected, you can reduce the rate at which your body loses heat and increase survival time by up to 50 percent. This is the most effective method of reducing the onset of hypothermia if there is a group in the water. The key to avoiding cold water immersion and hypothermia is to stay out of the water. Make sure you keep your boat’s deck and cockpit free of slipping and tripping hazards. If you do fall in, remember: don’t inhale water, don’t panic, keep as much of your body out of the water as you can and always wear a lifejacket. It can be the difference in a survival situation.